While Mastodon was graced with some of the more interesting light of the night, quick changes and a stack of monitors on the stage made this anything but a cake-walk of a shoot. 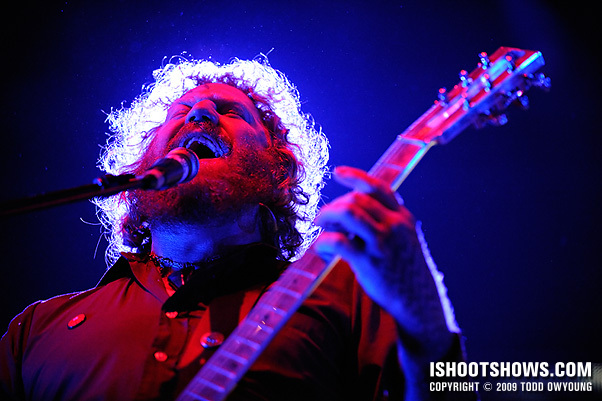 Still, the sheer intensity and delivery of Mastodon is enough to win over any music photographer even in spite of ghoulish color combinations. 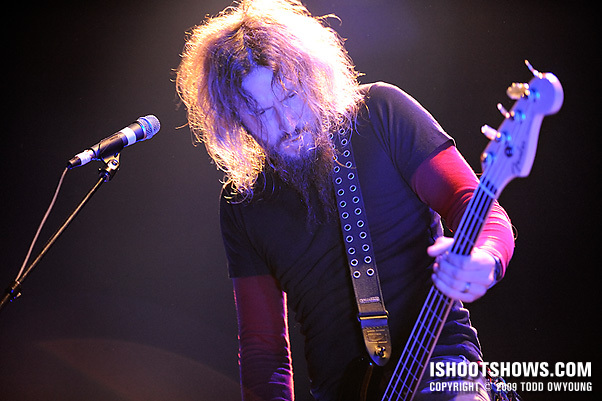 Mastodon are always great subjects for live music photography, and while the lighting was a beast for this heavy metal group, their set was still a blast to cover on the Adult Swim Presents 2009 Tour performing with Dethklok and Converge. 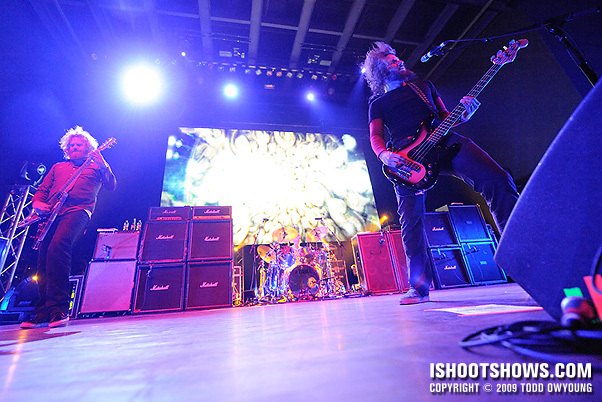 Overall, the band wasn't too active on stage, what with power stances and vocal duties that required attention, but Mastodon still laid down a really fierce performance. I was a little surprised in this regard, as I seem to recall that the guys moved around on stage a little more when I caught them at Mayhem Fest last year. The lighting mix for this set was a very deep treatment of cyan, magenta, and warm white light – sometimes all at once. Due to the height of the stage at the Pageant and the wedges, the Nikon 24-70mm f/2.8 was plenty wide for this concert, while the Nikon 70-200mm was nice for what it does best: bringing the action in close. Awesome Set Todd… great expressions! Thanks for the kind words. You bring up a very good point about the expressions – when the lighting is what I’d call poor like this, I think that expressions become even more important, as does pose/posture. Without the benefit of better lighting, any large or exaggeration of expression (facial, body, etc) becomes much more important in helping convey the energy of live music. When the band is physically inactive, I agree that capturing the expressions becomes the focus. There’s a moment where I’ll be thinking “OMG! DO SOMETHING FUN ALREADY!” haha But sometimes with just the right shot/angle/etc., even if they’re just standing there, it can still be a powerful image. Thanks for your thoughts here – I agree completely. 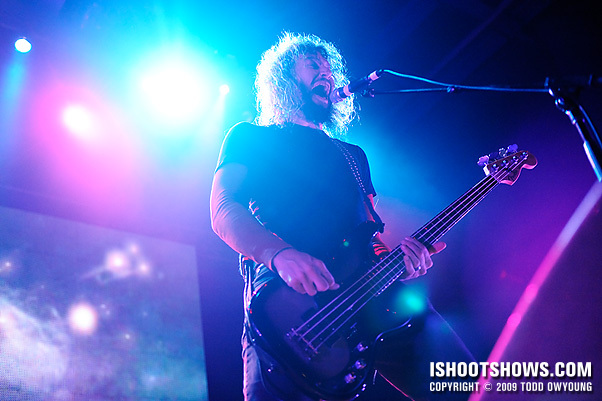 Luckily, Mastodon put on a pretty ferocious show, so their intensity made working with this light a little easier. the color combo is awful I didn’t perceived Mastodon’s music to be this color. I somehow imagined it more amber mainly due to the color of their albums. By the way it has happened to me too specially when light designers decide to go nuts with the reds in the LED’s. Some of them need color theory really bad, just saying. or a big book of rgb recipes for their software. Thanks for the comment. One thing I forgot to mention here with regard to the lighting was that there was a large video screen behind the band that was used during their show, so the lighting did serve a purpose in the visual hierarchy. But yeah – magenta-blue combos are never fun. Thanks again. That would be pretty metal. 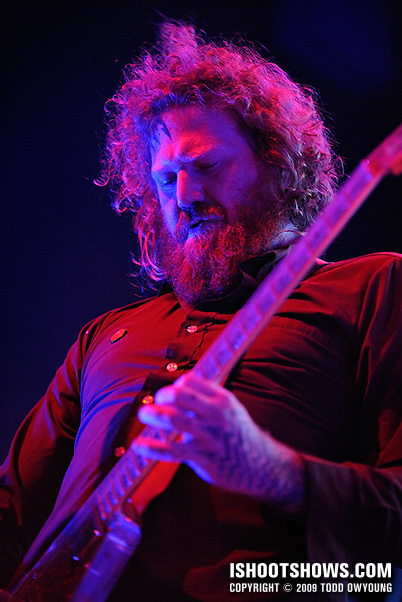 Todd, tonight will mark the 4th time shooting Mastodon for me, and I see that they haven’t given up their love of red and blue lights…ugh. with little to no front lighting. double ugh. still, they are a fun band to shoot and i am looking forward to shooting the show tonight. Good luck with this show. The lighting isn’t pretty, but there’s “enough” of it, generally speaking. 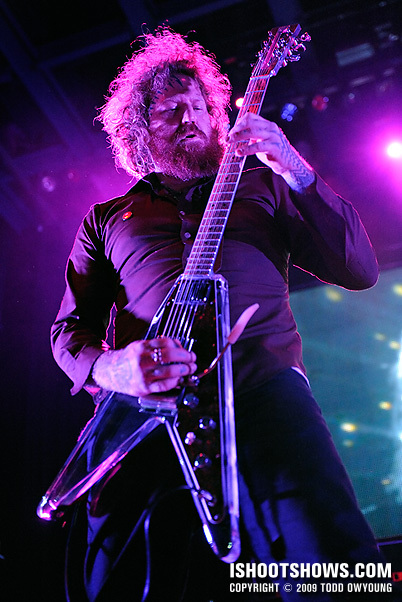 I think that I’ve been spoiled with Mastodon, since the first show of theirs that I show was at Pitchfork several years ago when they were playing at sunset, and then the other was at Mayhem Fest last year when they had amazing stage lights. 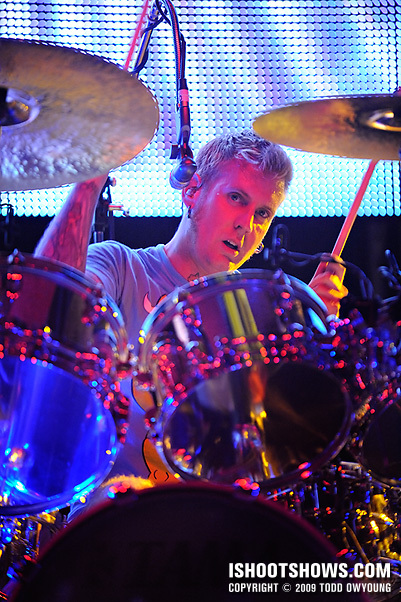 Love both of the drummer shots. 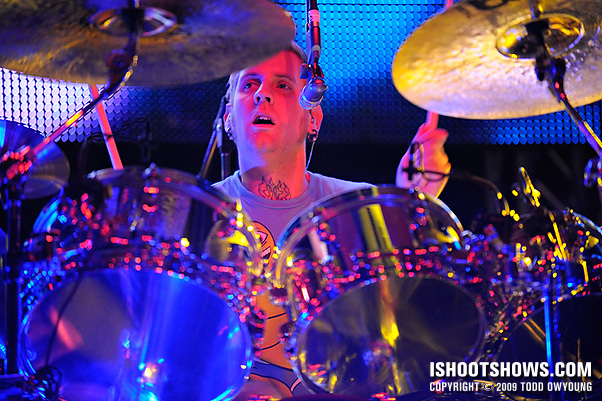 One thing about photographing Brann Dailor is that he had a microphone rigged up so that it came over his head from the back. When he had backing vocal duties, there was no way to get a clear shot of him – and even when he wasn’t singing, the mic came down right in front, so that was a no-go also. The only clear shots of his face came when he moved his head to either side, out of the way of the mic, so getting those two shots of Dailor definitely required a little patience! He did have some of the more interesting light on him, though, so he was a necessary target. Thanks, Liam – I appreciate it. to make matters worse, before they got on a guitar tech decided that shooters couldn’t go to right of Troy, towards Brent’s side…so all eight of us were smooshed into the half between Troy and Bill…this was really irritating, and when i saw that same guy side-stage after the set, i asked him about it. he gave some non-answer about no flash (duh!) and Dethklok’s management wanting that, but when Dethklok came on we had free reign of the pit again. weird. did you not get High on Fire at yr show? they were the best band of the night, both to shoot and listen to. These pics show me one thing…..color laden faces aren’t necessarily a bad thing. I usually scrap pics that have that much color in them. You’ve made me rethink my routine. Thanks. Good job. Hey I love the shots from the Mastodon show! I am shooting them tomorrow night, I know the guitar players, and I knew the lighting was very rich and I was a little intimidated by it!! Will you give me any advice? I shoot with the Canon Rebel XSI and I am bringing 2 lenes with me – 75-300 and a 24-70 2.8! If I am shooting in Manual mode what do you think would be the best ISO & Ap setting?? The venue they are playing it is brand new (they are like the 3rd show to be held there) so I do not know the layout yet!! 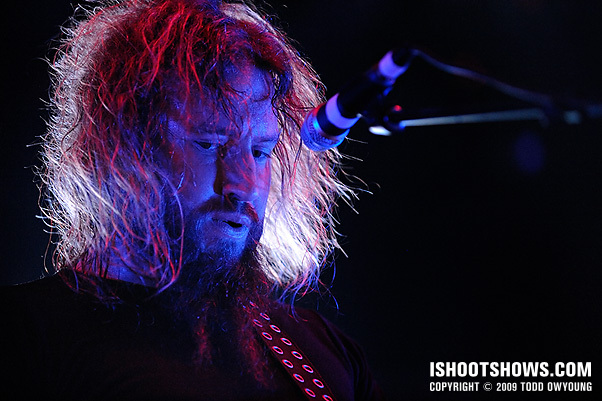 So some bands do not mind the flash (Actaully guite a few bands that I have shot) and I was looking up Mastodon and I can not find anywhere that tells of their preferences, do you have any advice? Did you shoot DethKlok’s set? Do you have any advice on that one as well?? I understand if you do not want to answer any questions but I would apperciate it! That first image is where its at…SICK!